Paneer 65 Recipe is the Most Popular South Indian Starter recipe which is suitable for all parties. Healthy snack for kids. This step by step procedure and video to make paneer 65 recipe Easier. Paneer Dum Biryani Recipe is my favourite Paneer Recipe. 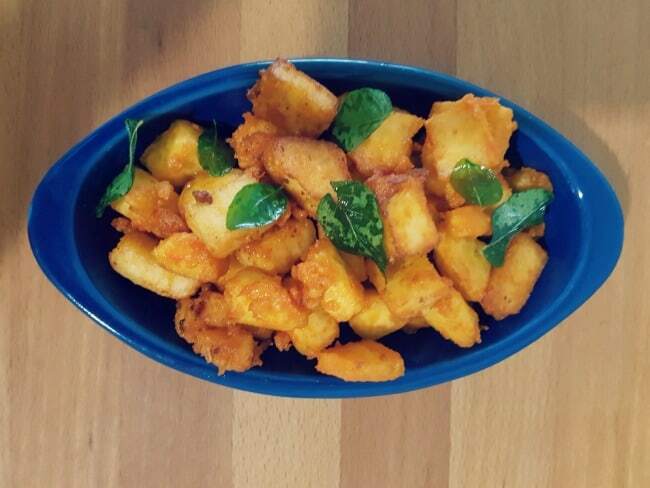 Any fritters or Appetizer Made of Paneer kids would love to have they won’t say no to it. There is no special chutney is needed to have this simply the Paneer 65 is going well with any sauce. Gobi 65 Recipe which I posted long back and make frequently at home too. Try this Paneer 65 recipe am sure you will make again and again. South Indian Style of making Paneer 65 is too good in flavour.This recipe calls for ginger and garlic paste, you can skip that also. Nice Panner Fingers you will get. Kids love that also. Step : 1 Take a mixing bowl add paneer, ginger garlic paste, corn flour, rice flour, Chilly powder, turmeric powder and salt mix well. Marinate it for 15-30 mins. Step: 2 After 15 mins, Heat Oil in a pan and Deep fry the Marinated Paneer. Once it turns Golden brown remove it from the stove. Fry little curry leaves in the same oil and takes out. This is Optional either you can garnish with onion and cucumber or with curry leaves. Delicious Paneer 65 is ready now. We can have it any sauce. 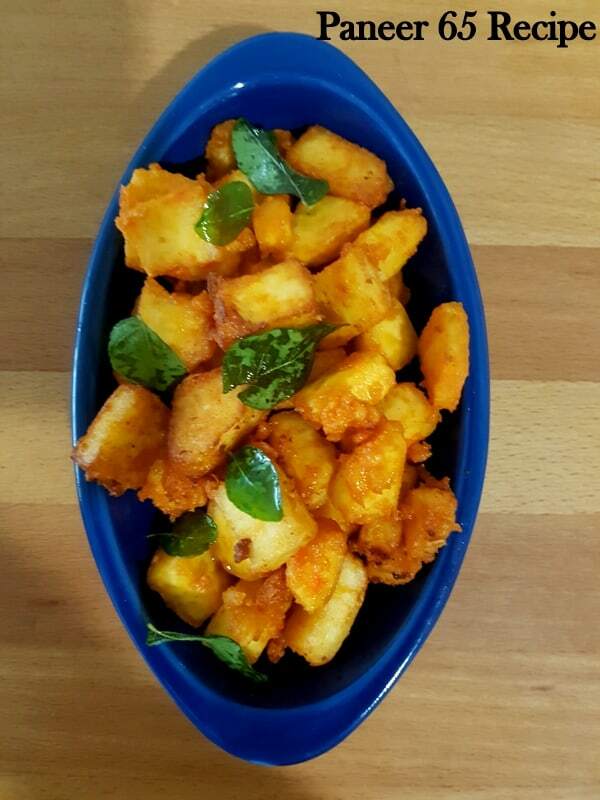 Paneer 65 is a crispy and spicy appetiser Recipe. Kids friendly snacks also. It is made of Paneer coated with corn flour and Rice flour with a dashing of South Indian Spices. Take a mixing bowl adds paneer, ginger garlic paste, corn flour, rice flour, Chilly powder, turmeric powder and salt mix well. Marinate it for 15-30 mins. After 15 mins, Heat Oil in a pan and Deep fry the Marinated Paneer. Once it turns Golden brown remove it from the stove. Fry little curry leaves in the same oil and takes out. This is Optional either you can garnish with onion and cucumber or with curry leaves. If your paneer is in the freezer, thaw it first and then add it to marinating process. You can avoid Ginger Garlic Paste.